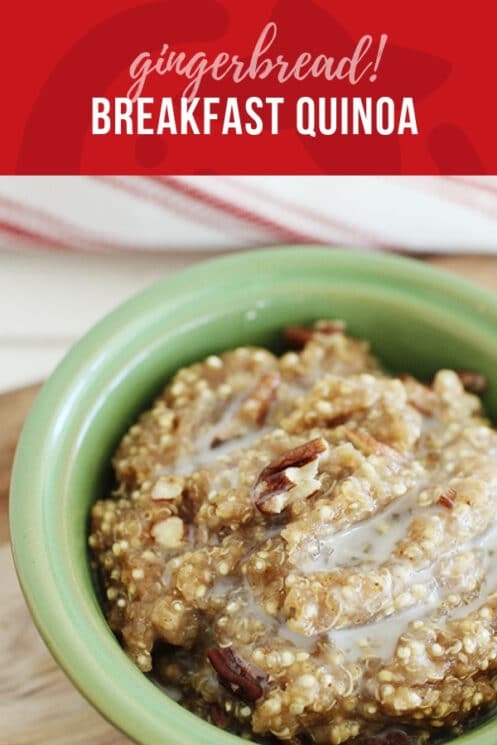 When it comes to breakfast, you can’t beat a nutrient packed bowl of quinoa! 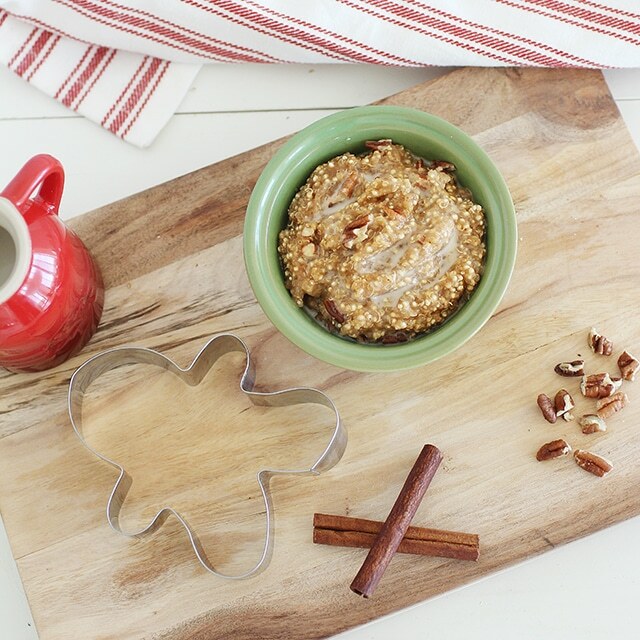 This gingerbread quinoa is sure to hit the spot. Starting your day with a sweet breakfast can be a recipe for disaster. Let’s take your classic muffin for example. While it might not taste like a dessert, but some muffins tend to have a lot of sugar. From the white sugar that sweetens it, to the refined all purpose flour you find as the base, that muffin may set you up to crave sweets all day long. So what does that mean for our bodies? It means our blood sugar spikes, we get that crazy sugar rush and then we crash. And what about the kids? If we feed them something that is filled with sugar for breakfast, they won’t be set up for a healthy day. They’ll be full of energy when they get to school and then crash mid-morning. It’s definitely not the ideal way to start the day. But here’s where it gets tricky. Sweet breakfasts make up the majority of the standard american diet – think baked goods, pancakes, waffles, french toast, even granola, cereals and yogurt. Of course, I’m not saying we can’t ever eat those foods, but they are certainly something we shouldn’t be eating every day. And that is where quinoa comes in. Quinoa is a complex carbohydrate meaning that it not only digests slowly which keep you fuller for longer, but it also doesn’t covert to sugar as quickly in the body. When you eat whole grains like quinoa, which are also filled with fiber and protein, your body has more time to process the nutrients and you’re not sent on this crazy blood sugar train. The other great thing about quinoa is that it’s versatile. You can make it into all sorts of different things and still maintain those high levels of nutrients. That’s why I think quinoa is one of the best breakfast foods you can have! I probably make breakfast quinoa a few times every week. It’s so simple, so fast, super filling AND there’s practically no end to the types of flavors you can make. Since we’re deep in the holiday season right now, I wanted to bring something festive and cozy to your breakfast table today. 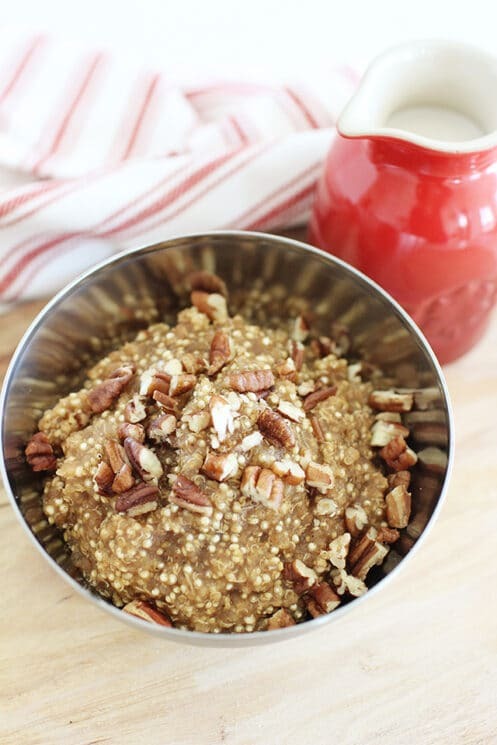 This gingerbread breakfast quinoa might just be one of my new favorite breakfasts. It comes together in less than 2 minutes, uses only natural sweeteners, is filled with fiber and protein, and it taste like warm gingerbread cookies. This is pretty much a dream come true to your little ones. 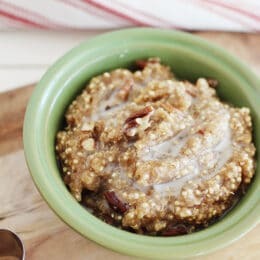 It’s a simple blend of quinoa flakes and cooked quinoa (if you can’t find quinoa flakes, you could always use quick cooking oats), sweetened with maple sugar, a touch of molasses and flavored with warm spices like cinnamon, nutmeg, ginger and cloves. I served mine with a splash of almond milk, a drizzle of maple syrup and some chopped pecans, but I’ll leave the toppings up to you. Go with what you enjoy and what you have on hand. It would also be tasty with a dollop of greek yogurt on top! 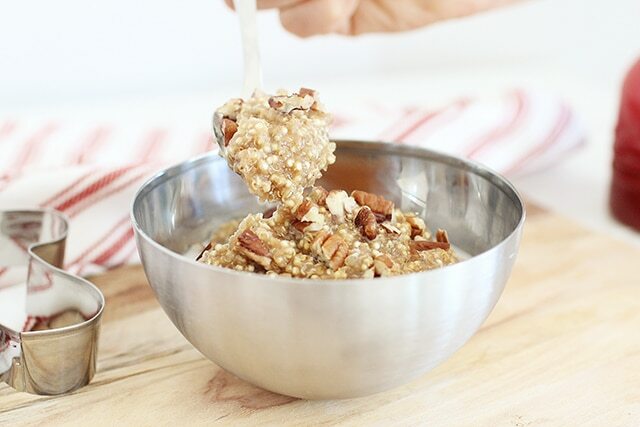 Combine the cooked quinoa, quinoa flakes, syrup, molasses, and water (or milk) in a small sauce pan. Bring to a boil then reduce to a simmer, stirring constantly for 90 seconds or until thickened. Stir in spices and vanilla. 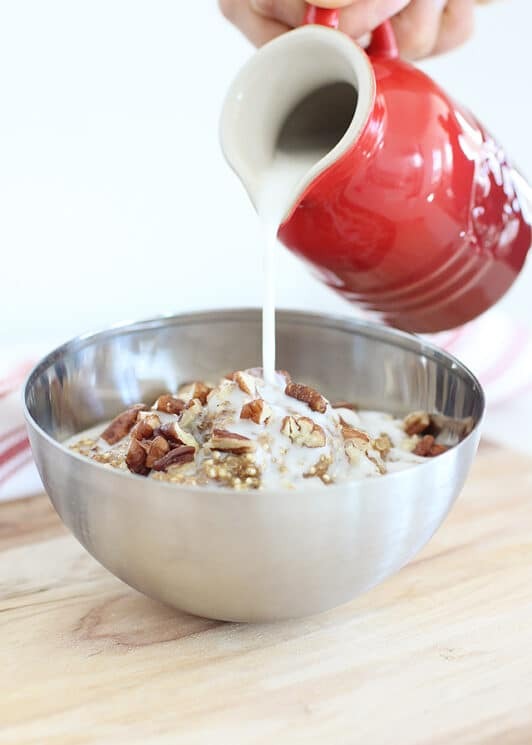 Drizzle with almond milk and sprinkle on pecans before serving. Maple syrup and molasses are both sugars. Our bodies will react and process them the same way. The maple syrup and molasses in this recipe add about 230 sugar calories. That is equal to over 14 teaspoons of sugar calories. The recipe sounds delicious, with the sugar even in a less processed state.